Artwork of Misstar from Mario Party 5. Misstar is one of the seven Star Spirits in Paper Mario. This young Star Spirit is pure-hearted but strong. She is one of the two female Star Spirits, and she wears a yellow ribbon on her head. Misstar is rescued by Mario and his team on Lavalava Island in Chapter 5: Hot, Hot Times on Lavalava Island. She is guarded by the aggressive Lava Piranha and his Lava Buds. After Mario rescued her, Misstar helps Mario, Kolorado and Mario's team escape the volcano that is about to erupt. She give Mario the ability to use the Smooch move. When Smooch is used, Misstar comes into battle and kisses Mario, restoring his HP by twenty. The move requires three Star Power to be used. She later appears along with the rest of the Star Spirits in Star Haven when they give Mario the Star Beam. She is also found in Mario Party 5, where she hosts the story mode. 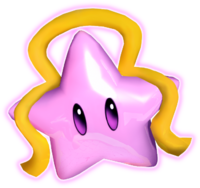 A Star Spirit that looks like Misstar appears in Mario & Luigi: Partners in Time. In Star Hill, a Star Spirit with a mouth and a ribbon that always flows appears and tell the Mario Brothers and Baby Brothers to gather all the Cobalt Shards. However, it is revealed that she was not a Star Spirit and was actually Elder Princess Shroob in disguise. Misstar appears as a sticker in Super Smash Bros. Brawl. It increases the power of energy attacks by 7, and it can be used by any character. Nēru From ane, older sister. Misstar is the only Star Spirit aside from Eldstar that can be Tattled on. Misstar slightly resembles the character Starly from the game The Legendary Starfy. When selecting a file, Misstar is with a red scarf, but in the game it is yellow. ↑ iQue's Paper Mario instruction booklet, page 30. This page was last edited on April 15, 2019, at 06:50.